President of Serbia H.E. Mr. Aleksandar Vucic attended the inauguration ceremony of President of Turkey H.E. Mr. Recep Tayyip Erdogan in Ankara and pointed out that it is very important that Serbia has such a strong regional partner as an ally, and not as an enemy or an opponent. 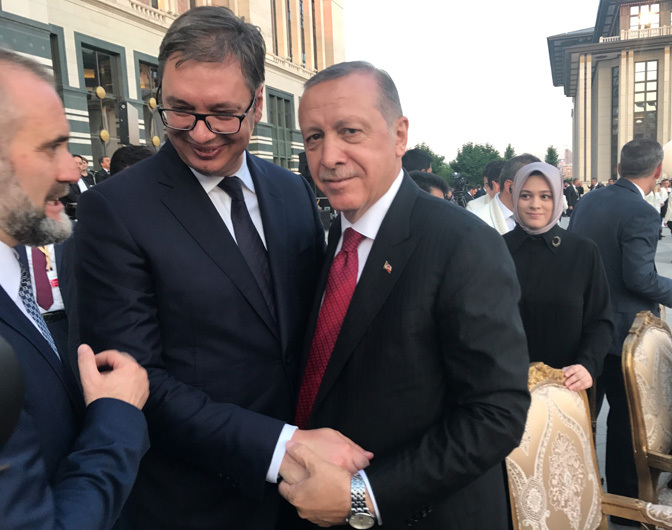 Vucic reminded that this has been his third or fourth meeting with the Turkish President in a very short period of time and that he came this time to the inauguration ceremony in the name of all Serbia in order to honor and pay respects to Turkish state, people and their president. He added that Erdogan made a very warm welcome for Serbian delegation and said that two countries have a lot of plans for the future and a lot of stuff to solve , especially in the domains of economy and politics. He expressed his expectations on further flourishment of the bilateral cooperation and visit of Turkish president in the next period that is very important for Serbia`s future. Vucic emphasized that he is very proud that Serbia has Turkey as its friend and ally which is the result of our politics. During the stay in Ankara, Vucic had opportunities for a couple of bilateral meetings, such as the ones with Bulgarian President Rumen Radev, Macedonian president Djordje Ivanov, Hungarian Prime Minister Victor Orban, Albanian Prime Minister Edi Rama and Bakir Izetbegovic Bosnian Presidency Member.